Gene Luen Yang has made a career out of exploring issues related to racial identity, personal beliefs and the relationship between the two and the importance of family. The themes surrounding his first major book, American Born Chinese (shame, identity and connection as an Asian-American) may not dominate any particular work, but they're always there in one form or another. Yang has always had two major flaws as a cartoonist: his treatment of these issues is often too didactic and on-the-nose; his art style is far too slick and slightly bland to sustain my interest as a reader. As he's continued to explore variations on these themes, his storytelling has subtly begun to shift in ways that improve the reading experience. His epic Boxers/Saints finally and openly grappled with issues of faith in a way that he had only hinted at in earlier works, and while it firmly came down on the side of his own Christian faith, he allowed for a surprising amount of ambiguity and criticism of the way Catholicism was spread in China. 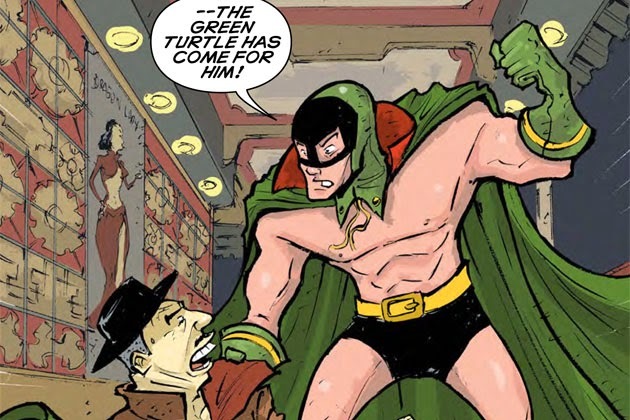 In his newest and most lighthearted book to date, The Shadow Hero, Yang further buries the more polemical qualities of his ideas in an action comedy romp. The background of why he chose to do this book is almost as interesting as the book itself. 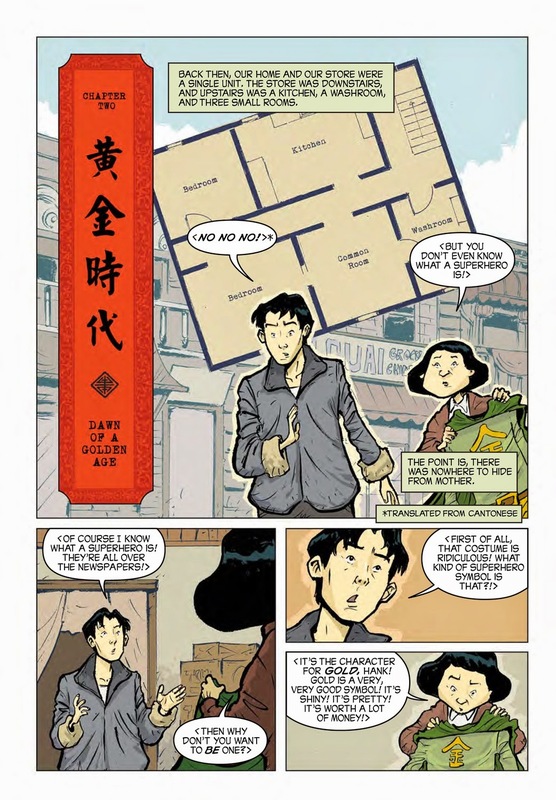 Yang learned of a Golden Age cartoonist named Chu Hing, the first Asian-American cartoonist. He created a superhero in 1944 named The Green Turtle, who appeared in the pages of Blazing Comics for just a few issues. A bare-chested hero who mysteriously never showed his face, Yang theorized that Hing wanted to make his hero explicitly Asian (or Asian-American) but wasn't allowed. So the theory goes that Hing deliberately kept his face hidden so as to allow the reader to make up their own mind. As a storyteller, what Yang excels at most is structural problem-solving. He almost always throws in a plot-related knuckleball to keep the reader off-balance, and structures his plot around those game-changing story tentpoles. As such, The Shadow Hero is Yang's master class at plot structure, pacing, managing sub-plots and the use of broad characterizations to act as plot movers. Yang chose to fill in the many missing elements of the Green Turtle's origin and background and in so reverse-engineering the story, found ways to create a funny, compelling and exciting adventure. All of Yang's themes are still intact, just buried somewhat underneath the comedic and visceral elements of the story. 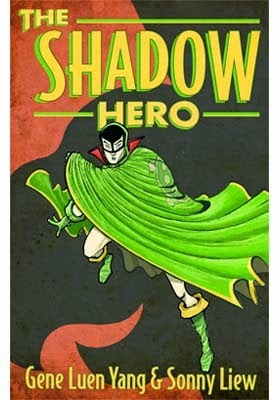 At its heart, The Shadow Hero is all about the experience of Asian-American immigrants (the story takes place in the 1930s), as both the heroic Hank (later the Jade Tortoise) and the villainous Ten Grand both turned out to be the manifestations of animals spirit gods that had protected China for centuries. Yang is able to reference the casual racism towards Asians of the day, including from a putatively-heroic character, and then let it drop as he gets back to the story. Yang isn't afraid to go broad in this story. Hank goes from being kind of a nebbish to a tough, capable hero who even manages to acquire a super-power. That said, he's a straightforward character compared to his mother, Hua, whose vacillation between shame and excitement is portrayed with great affection, especially because of the ways in which coming to America broke her spirit. Yang channels a bit of Derek Kirk Kim in the exaggerated way he writes her, especially once she gets it in her head to turn her son into a superhero. Throw in Hank's eventual fighting mentor Uncle Wun Too, villains like Mock Beak and the three beautiful but deadly daughters of Ten Grand, and one finds Yang dipping into outsized Asian character types while gently mocking them. Indeed, Yang is careful to give us the interior lives of the people behind the characters, so to speak, a view not seen in traditional Western appropriations and grotesque attempts at making Asians solely monstrous or objects of laughter. A good example is when Mock Beak thinks he's being attacked by a Caucasian super-hero, he uses the sort of pidgin English vernacular in order to try to convince his assailant that he's a simple and obedient immigrant. When he realizes that the Green Turtle is the son of a man he killed, he coldly reverts back to his true self. It's the kind of simple but effective scene that underlines Yang's commentary without taking over the narrative. 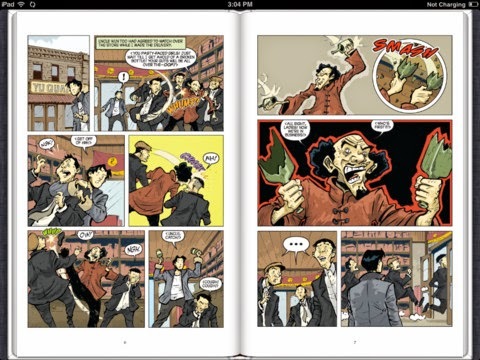 A major part of the book's success is the work of artist Sonny Liew. A veteran of many quasi-mainstream projects, his light touch and sketchy line were built for farcical action stories such as this. When he needs to get "loud" on the page and depict action and movement in an exciting manner, he's up to the challenge. When he needs to draw scenes exaggerated for comedic effect (like when Hua tries to give her son superpowers by dunking him in toxic chemicals and other hazardous methods), he takes great delight in adding all sorts of eye pops that make the scenes laugh-out-loud funny. When he needs to get romantic or quiet, Liew reins it in appropriately. The story is still very much structured like a Yang story, but it's clear that he gave Liew a great deal of leeway in just how to get across the action and humor. The supplemental material that Yang includes, including a Green Turtle story, is fascinating both in terms of revealing his inspirations as well as the elements Yang had to reverse-engineer in order to make his story work. Having that kind of pre-programmed structure seemed to greatly benefit him as a storyteller, and the result is perhaps his best all-around work to date. This is a story with a lot of layers disguised as an enjoyable goof, and that seems to be precisely Yang's speed.